New WordPress site design and launch, with Mail Chimp for mailing list emails and management. 2016. After parting ways with her former business partner, going on hiatus, and launching the Workshop Tasting Room, the proprietor wanted to get the word out. She already had a great space, local clientele and a couple hundred people on her mailing list. But she wanted to also have a web presence, manage her email list, and create attractive emails in HTML. Oh, and did I tell you she was on a budget? Using a basic free WordPress theme (Twenty Sixteen), I took her logo and built a web site to feature her new space. We also came up with a great tagline: The Workshop Tasting Room, a great place to taste wine in the North end of Tacoma. With some free Public Domain and Creative Commons stock art, plus some photos my client had taken, we built a simple, friendly, welcoming website. I also used Search Engine Optimization (SEO) to help people find her, and edited her content to drive traffic to her shop. I created a Facebook page for her with a cover graphic and profile picture, so she could start building a following. This way, she could also run local ads for upcoming specials and events at the Workshop Tasting Room. Finally, we installed MailChimp, and I created templates with header images and taught her how to create emails and manage her list. 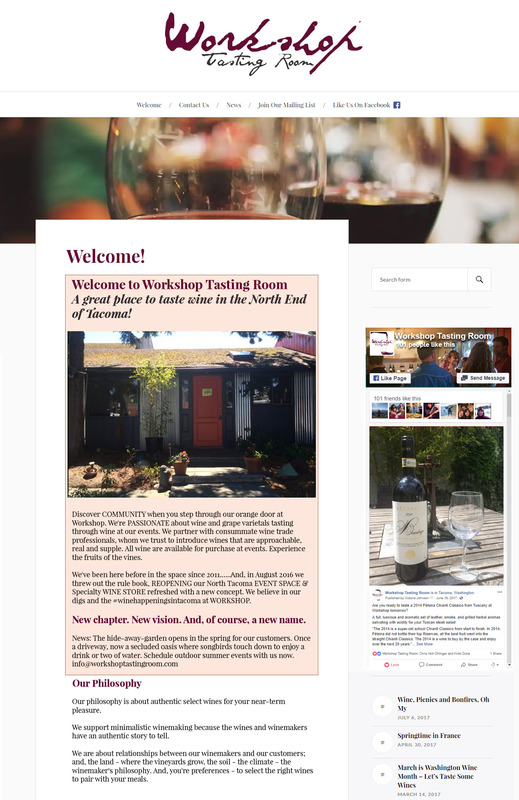 Since Mail Chimp is free to use for under 2,000 subscribers and offers incremental upgrades, my client can scale up as the Workshop Tasting Room grows. Mail Chimp also makes it easy to see which emails get opened, add and remove subscribers. 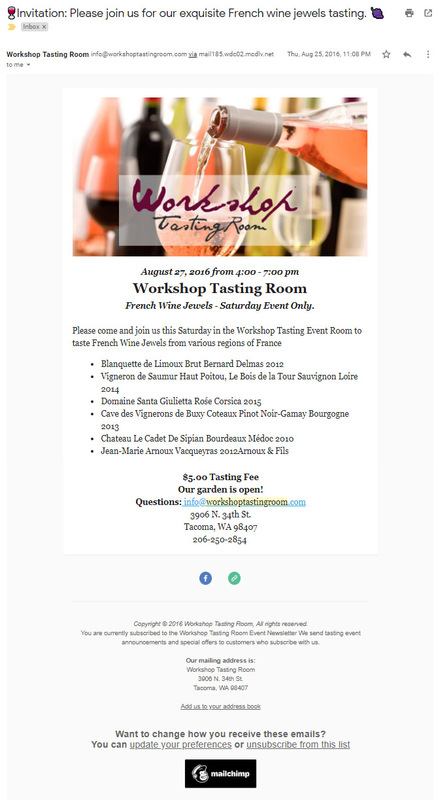 Here’s the invitation to the French wine tasting. Here’s the email invitation to a fall event. 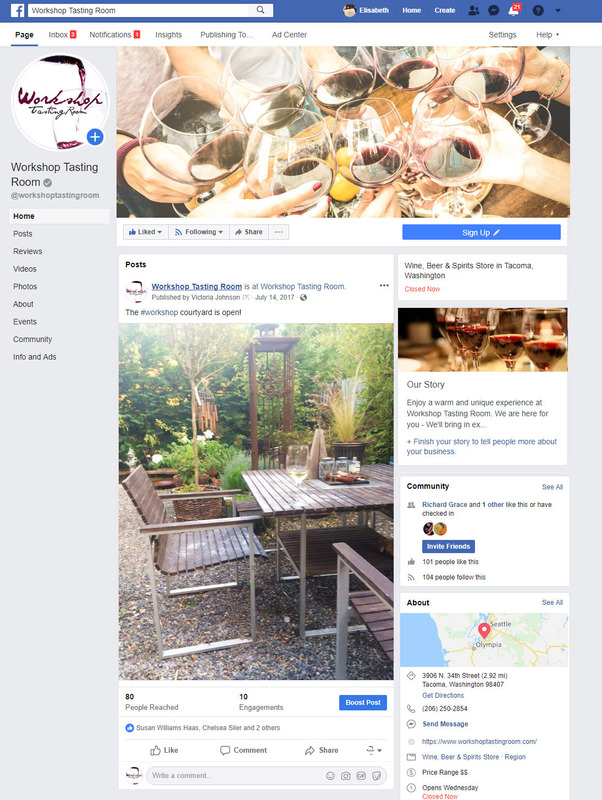 The Workshop Tasting Room is still in business, my client took the website down. This makes sense as I’d originally advised her to save time and money and just use Facebook for her web presence. You can still view a version of the site in the Wayback Machine.